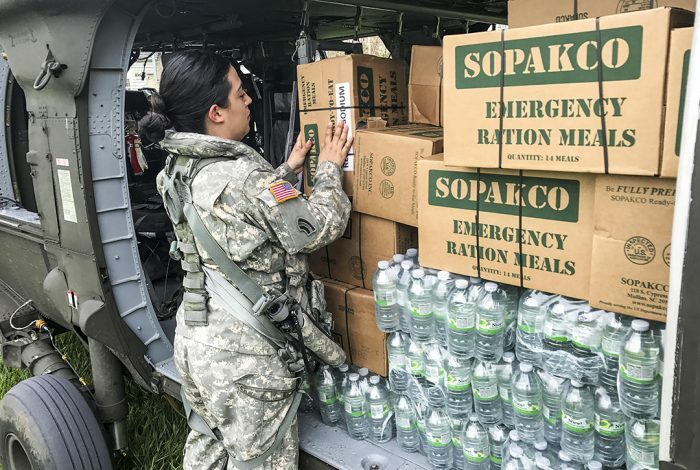 A Puerto Rico National Guard soldier transports food and water as part of Hurricane Maria relief efforts. Will President Donald Trump, the self-styled “great builder,” authorize enough federal aid to rebuild Puerto Rico? Will Congress alleviate its crushing debt? To prevent a mass exodus of Puerto Ricans, the Trump White House and Republican-controlled Congress will have to act fast. Over two weeks after Hurricane Maria’s landfall on September 20, most of Puerto Rico’s 3.5 million people were still without power, potable water and telecommunications. Many have no jobs to go back to, since their businesses were destroyed. The government expects to run out of money by October 31, terminating its hurricane recovery effort. Puerto Rico, unlike Texas and Florida, or Wall Street’s too-big-to-fail banks, has little political leverage in Congress. The island’s young governor, Ricardo Rosselló, says Maria is the biggest catastrophe in the history of Puerto Rico. He hopes Puerto Ricans will be “treated equally,” despite its neo-colonial status as a US territory. Puerto Ricans were granted US citizenship 100 years ago, but have remained trapped in political limbo. They cannot vote for US president and have no voting representative in US Congress. Almost half of all Americans don’t know that Puerto Ricans are US citizens. When Maria hit, Puerto Rico was already devastated by economic recession and bankruptcy, as well as a political and legal battle over who governs the island. Puerto Ricans were already migrating to the US mainland in record numbers. The governor is panicking, worried that US Congress will deliver too little help, too late. “You’re not going to get hundreds of thousands of Puerto Ricans moving to the states, you’re going to get millions,” he said at a news conference hours ahead of Trump’s visit. “There is going to be a big population loss out of this tragedy. As soon as travel resumes and is back to normal, there will be an exodus of families and individuals from the island. It’s inevitable,” said Héctor Figueroa, a native of Puerto Rico and president of the Service Employees International Union Local 32BJ. After Hurricane Katrina, the population of New Orleans fell by 50% and has not recovered 12 years later. The political implications of this demographic shift have led to intense speculation about how many Puerto Ricans will move to Florida — and register to vote. Their arrival could see it move from being a swing state to a Democratic one. But the morning after, Office of Management and Budget Director Mick Mulvaney adamantly dialed back the statement. Trump didn’t mean it “word for word,” he said. Nothing that Trump said or did, ahead of or during his visit to the devastated island, hinted at this stunning admission of what it will cost to rebuild Puerto Rico. Trump tossed rolls of paper towels to storm victims in a Puerto Rican church. He didn’t promise billions of dollars. Ahead of his visit to Puerto Rico, Trump seemed incapable of empathy, picking a public fight with the Mayor of San Juan and suggesting that the victims of Hurricane Maria are lazy people who “want everything to be done for them.” Earlier this year, Trump even threatened to shut down the US government to prevent emergency Medicaid funds from flowing into Puerto Rico. Bondholders have been quick to point out that Trump is not a dictator and cannot cancel Puerto Rico’s debt with an executive order. But he could easily ask the GOP-controlled Congress to bail out Puerto Rico, just as it bailed out Wall Street Banks during the financial crisis. At a minimum, Congress could suspend debt payments until Puerto Rico recovers. Congress could also extend its brief waiver of the Jones Act, the 97-year-old law requiring all shipping to be in ships owned and operated by US citizens. The law raises the price of food, energy, medicines, clothing and building supplies. But Puerto Rico, unlike Texas and Florida, or Wall Street’s too-big-to-fail banks, has little political leverage in Congress. 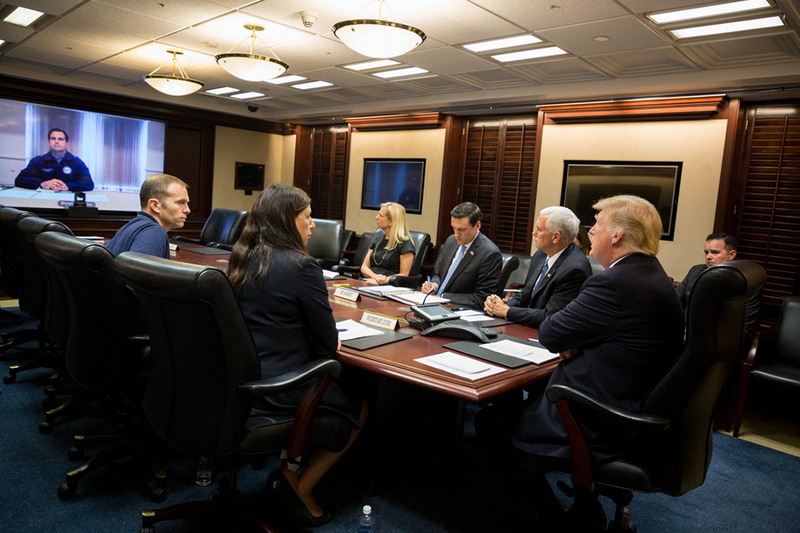 President Trump speaks to Puerto Rico’s Governor Rosselló during a teleconference. Because of the debt crisis, Puerto Rico’s democratically elected government is essentially powerless to act on its own initiative to rebuild. It does not have money to fix roads, to rebuild schools or hospitals, or to reconstruct the power grid. The Commonwealth owes $74 billion to bondholders and $50 billion for public employee pensions. Many of the bonds that Wall Street firms sold to Puerto Rico took the form of predatory loans and at least some of the bond deals were probably illegal. When Puerto Rico’s government declared bankruptcy in May, it was the biggest bankruptcy in the history of the US municipal bond market. A laboratory for experiments in austerity under the oversight board, Puerto Rico could also become, post-Maria, a testing ground for Trump’s much touted private-public partnerships for infrastructure. The oversight board, or “junta,” as Puerto Ricans call it, has the final say over revenue and spending. It has dictated a 10-year fiscal plan that makes cuts to infrastructure, education, health and housing. The board has closed schools, slashed the minimum wage down to just over four dollars and cut public health funds by almost a third. When Maria hit, Puerto Rico’s governor Rosselló and the oversight board were in a power struggle, with mutual lawsuits underway, over steep cuts to pensions and the junta’s demand that his government shut down two days a month. Hurricane Maria has changed all that. The board shares governor Rosselló’s anxiety that Congress might fall short. “Failure to provide the greatest amount of federal aid and the emergency liquidity program will be potentially ruinous,” wrote its chairman, Jose Carrion, in a letter to congressional leaders, citing estimates Puerto Rico has suffered $95 billion in damages. Rosselló has reallocated government funds for emergency relief but could do so only after the oversight board gave its permission. “Once PROMESA [the oversight board] was put in place, the politics regarding the federal government returned to a classic colonial state. The only precedent I can think of was in the early 20th century when all political and economic and fiscal decisions were made by US appointed officials,” Duany told WhoWhatWhy. Privatizing Puerto Rico to ‘Keep the Lights on’? Authorities are warning that it could take months for PREPA, the public utility that is the sole provider of electricity, to bring the island back online. The power grid was already in shambles before Maria and the utility has lost many of its skilled workers to emigration. Consumers pay an average of two to three times more for power than Americans in the 50 states. Over two weeks after Hurricane Maria’s landfall, 89% of the island’s residents still lacked power. The board/junta’s fiscal plan, which forces cuts in pensions and limits bargaining rights for organized labor, offers a single idea for actually creating jobs: selling public assets to private investors, beginning with the energy sector. Like Puerto Rico’s government, PREPA is insolvent. Three years of failed talks with its creditors, mostly hedge funds and mutual funds, ended in bankruptcy this summer. Rosselló, despite his struggles with the oversight board, is in agreement. A political neophyte, the governor has shown great enthusiasm for cash-up-front privatization, offering to sell off public assets like the water and sewer authority. Some of Puerto Rico’s public assets are already controlled by private investors. In 2013, Puerto Rico sold a 40-year lease to its international airport. The island’s busiest toll roads are in the hands of a public-private partnership that includes Goldman Sachs. Many economists dispute that privatization will create jobs or cut costs for consumers. Nor is it clear that private investors, if they do modernize the power grid, will make the energy sector any greener. PREPA already has private partners selling power from coal and natural gas. An island with vast potential for solar and wind power, Puerto Rico relies on fossil fuels for 98% of its energy. “The experience that we’ve had of privatization of the grid has not been good,” says Ruth Santiago, an environmental lawyer. AES Corporation, the Virginia-based power giant, built one of the world’s largest coal-fired power plants in 2002 near where she lives, in Guayama, to sell power to PREPA. It releases 400,000 tons of toxic coal ash a year. The contamination threatens farms, wetlands and groundwater. Santiago says the best option for communities like hers would be microgrids — small-scale systems combining solar panels and storage batteries. In the wake of a hurricane, they can restore power a few buildings at a time. No one really knows how many Puerto Ricans will arrive in the United States in the coming weeks and months. Like millions of Puerto Ricans throughout the US diaspora, Héctor Figueroa is worried about his family on the island. “At some point, the question we all face is, ‘do we bring family members here? '” The answer will depend on how fast a semblance of normal life is restored. Figueroa said he still hasn’t been able to reach his 93-year-old father in the remote mountain town where he lives. He is in touch with a sister who tells him his father is alright but living without electricity and running water.